It’s tourney time! But before you fill out your bracket, we’re here with some historical perspective that might give you some competitive insights. As the excitement of the NCAA® Men’s Basketball Championships—and the controversy currently surrounding the sport—grip the nation, let’s look back at which teams have had the most and the deepest tournament runs throughout the last quarter century. *All data in this piece is current as of January 2018 and includes wins that may have since been vacated. 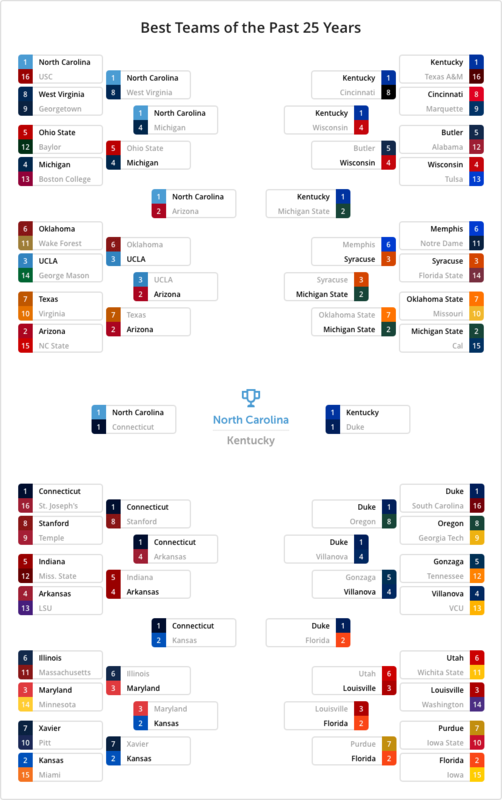 Along with counting total tournament appearances and wins, we also weighted wins as teams got deeper into the tournament—just like you would score a bracket you filled out. 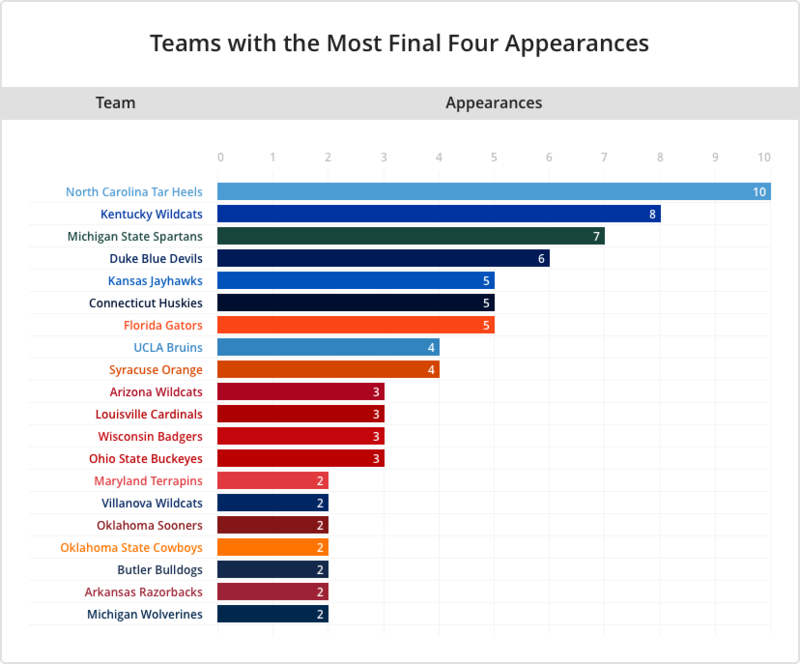 Based on our analysis, North Carolina is the best NCAA Men’s Basketball Tournament Team of the past 25 years. This was a close contest. Kentucky, Duke, and Kansas all have more tournament appearances than North Carolina. 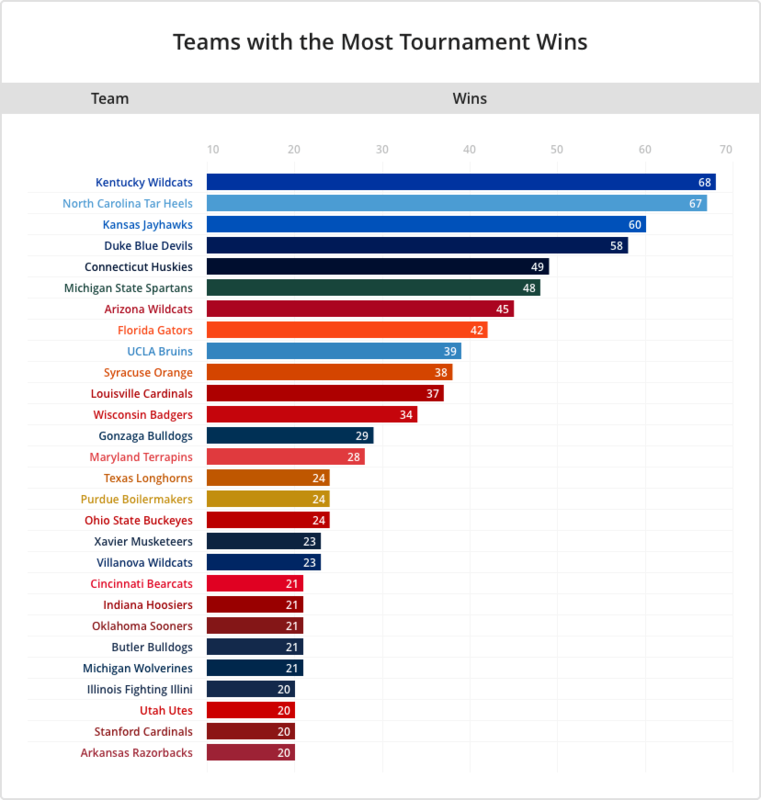 Kentucky even has more tournament wins total. But North Carolina made it to 2 more Final Fours than Kentucky and, thanks to 2017’s win over Gonzaga, has 1 more championship. Wins in these heavily weighted rounds give North Carolina the edge. See full stats on all teams. Most teams that made the tournament made it at least twice. Over 270 teams made at least 1 appearance in the tournament in the past 25 years, and over 220 of them made it at least twice. Only 3 teams have 60 or more wins in the past 25 tournaments: Kentucky, North Carolina, and Kansas. North Carolina is the only team to make 10 Final Four appearances in the last 25 years. This means 40% of Final Fours since 1992 featured North Carolina. Kentucky, North Carolina, and Duke have all played in 5 NCAA Men’s Basketball Championship games. Connecticut is right behind them with 4 games. Connecticut has also been the most efficient tournament team of the past 25 years. It ranked as the number-four team in our bracket scoring, despite having fewer tournament appearances, fewer Final Four appearances, and fewer championship appearances than the other schools in the top 4. That means that although Connecticut may not get to the tournament as often as the other powerhouses, when Connecticut plays, it usually wins. Connecticut has the best winning percentage in championship games. It won all 4 it’s played in. The last 25 titles have gone to just 14 schools. And just 5 schools won 64% of all national title games since 1992. These 5 schools have the only teams to win more than one title in the same period. Using the same method we used to measure team success, we also looked at success on a conference level. Not surprisingly, the Atlantic Coast Conference—home of both North Carolina and Duke—came out on top. *Conference stats reflect historical performance of the teams that are current members of each conference. Teams from 32 different conferences have made the tournament at some point in the last quarter century. 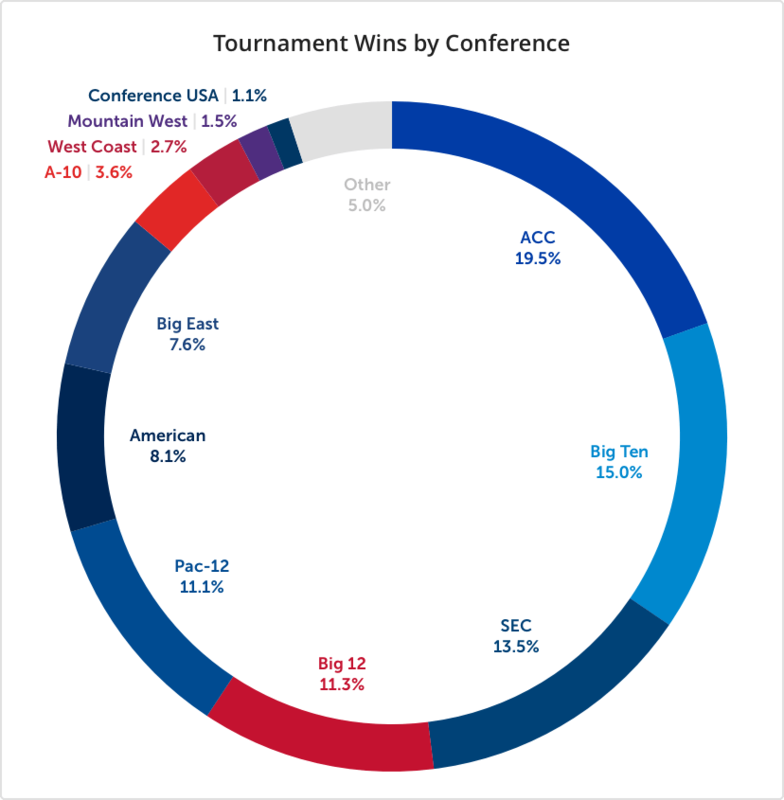 Despite the wide array of conferences participating, the winner’s circle is much smaller for this time period: schools from just 7 conferences won over 86% of tournament games. How did your team rank? 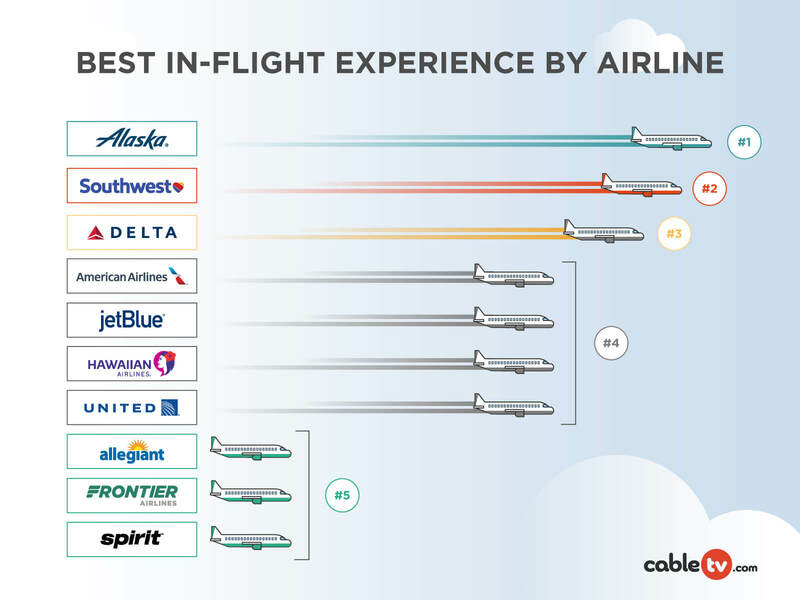 Find out where your favorite team ranked in the chart below. Don’t forget to give a shout-out to your alma mater in the comments. Share this with your friends so you can brag about your team coming out ahead! This year’s tournament will be broadcast on CBS, TBS, TNT, and TruTV. These channels will air different tournament games simultaneously. Make sure your TV package has these channels so you don’t miss a minute of the action. If you need a new TV provider to access the channels, enter your zip in the box below to find the available TV providers in your area. Teams that tied were sorted alphabetically. 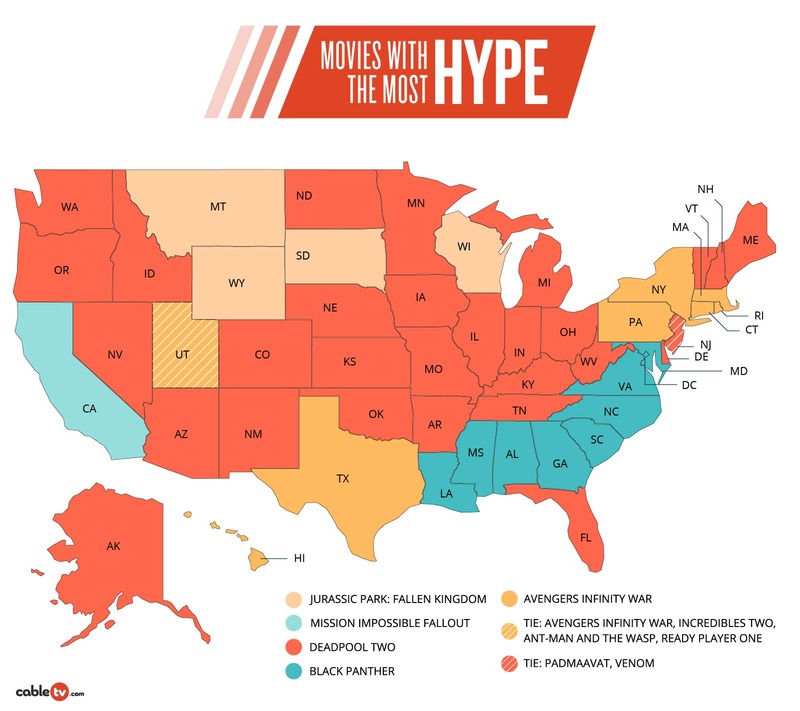 What’s the Cheapest Way to Go for HBO? John Dilley is an endless source of new ideas. With a background in both sports and music, he offers a unique perspective. He has written for The Daily Utah Chronicle, Filler, and has contributed content to several commercial websites.